Responsive design is an approach to web design that enables pages to adjust to a display resolution of any type of gadget - whether it's a personal computer, a tablet or a smartphone. Bootstrap can be described as responsive, mobile-oriented framework. It's easy to use and has a wide array of convenient assets. A parallax scrolling is a method in webdesign when background picture moves at a less quick rate compared to a front content, forming the illusion of 2D effect. By utilizing the parallax scrolling animation, you may include the optical illusion of depth to your internet site, so displaying your information in a much more good looking manner. Appointment Manager is another plugin created for WordPress that enables your guests to schedule an appointment by themselves. This block provides automation to the scheduled appointment reserving procedure. You don't have to fill in the appointment calendar by hand and check it - the plugin really does all the job for you. Moreover - it helps you to set the reserving form appearance and filling. Due to the use of Bootstrap a website will be able to adjust its content to any display resolution. It's necessary for both SEO and website users. Search Engine Optimized templates were tailored to bring in buyers and browser's search engine crawlers to your business site. SEO enables to reach the top of Google search results and fit the ranking factors necessary for the most popular search engines. As a result, your website is visible on the web. Is it possible to use your web templates for Designers to develop websites for my customers? Yes. It is perfect for designers who want to offer their customers a high-quality design and also save time and money. Keep in mind that when you purchase the website template for Fashion Clothes with ordinary or exclusive license you're entitled to create only one project (one domain name). I like the image from the web template for Skin Care Store and would like to use it for my advertising campaign, can you send me this image in a higher resolution? No, we can't provide image in higher size or resolution rather than it is on the web template for Skin Care Store. We recommend looking for professional images on online photo resources. Is it reasonable to make unique purchase of website design for Vintage Fashion that was already purchased before? Yes, it's reasonable to make a unique purchase of website design for Vintage Fashion. Because there is very small chance that you will find the same design on the net. There are more than 3,000,000,000 webpages online now according to statistics on www.google.com. Is it possible that Template Monster will contact my client which website I made from Template Monster's website website design template for Ladies Fashion ? Yes, our legal department checks licenses regularly. In case we won't find designer's contact information on the site which was made from the website design template for Ladies Fashion of ours we will contact the owner of the site directly. What is a buyout purchase license for website design for Fashion Journalist? If you purchase the product at a 'Buyout price' it guarantees that you are the last person to buy this template from us. It means that this website design for Fashion Journalist may have been sold before a couple of times (see 'Downloads' number in item's properties) but only you and people who bought the template before you will own it. After this kind of purchase the template is being permanently removed from our sales directory and is never available to other customers again. The buyout purchase license allows you to develop the unlimited number of projects based on this template, but the template should be customized differently for every project. 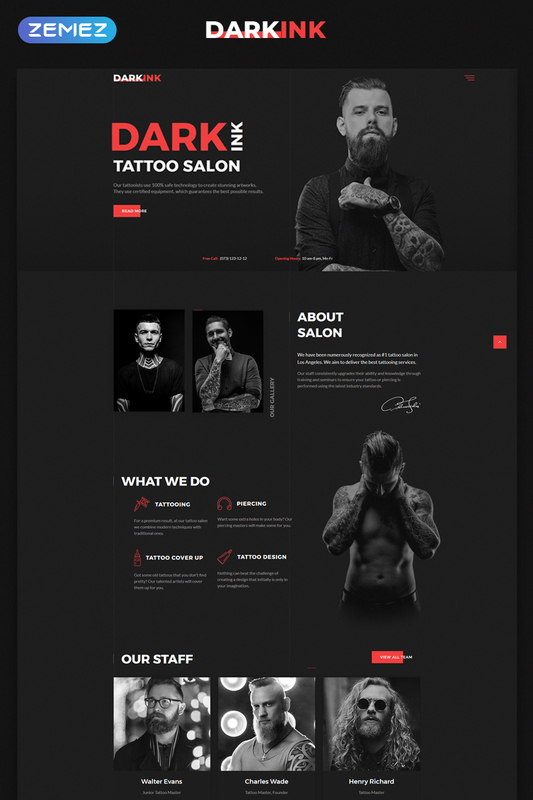 I would like to purchase web template for Tattoo Store, but it is not available on the site anymore. 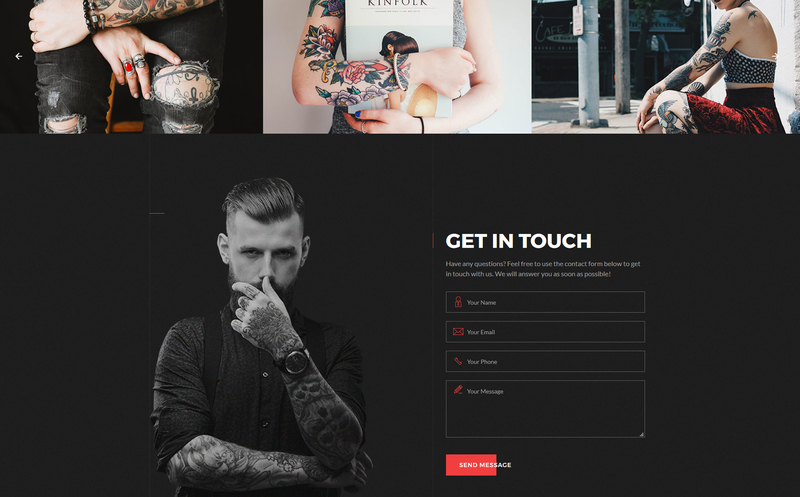 The web template for Tattoo Store has been sold out for exclusive price or discontinued.As technology inevitably develops, TemplateMonster may discontinue the production of certain products. It can be no longer available for sale because of being outdated. Can I integrate the website design template for Photo Classes with third-party software or applications for development of my new products? No, you cannot get the developers license for development of website design template for Photo Classes or other products. I would like to make payment for Fashion Trends website template by company check. Is that possible? Please use Skrill payment option. They accept payments by check.You can place an order for Fashion Trends website template on the site under the name of the company and choose Skrill merchant system for making payment from the company's account. To initiate bank transfer, please create an account here - www.skrill.com, add the number of your bank account and verify it. After that, you can place an order on our website and choose Skrill on checkout page. When the payment is made, the product will be sent to your e-mail along with the invoice under the name of your company. Can I put a line at the bottom (or any other spot) of my new product "Website development by Company name" after purchasing website template for Petite Fashion? Yes, you can place a note at the bottom (or any other spot) of my product "Website development by Company name". Nevertheless, you cannot place "Website design by Company name" while using one of website template for Petite Fashion. Are there any restrictions for using imagery, cliparts and fonts from the web template for Photography Portfolio I purchased? All imagery, clipart and fonts used in web template for Photography Portfolio are royalty-free, if not stated otherwise on the product page, and are the integral part of our products. One Time Usage License and Developers License give you the right to use images, clipart and fonts only as a part of the website you build using your template. You can use imagery, clipart and fonts to develop one project only. Any kind of separate usage or distribution is strictly prohibited. What is a unique purchase license for Cosmetics Department Store website design template? If you purchase the product at a 'Unique price' it guarantees that you are the first and the last person to buy this Cosmetics Department Store website design template from us. It means that this template has not been sold before and you become an owner of a unique design. After this kind of purchase the template is being permanently removed from our sales directory and is never available to other customers again. The unique purchase license allows you to develop the unlimited number of projects based on this template, but the template should be customized differently for every project. 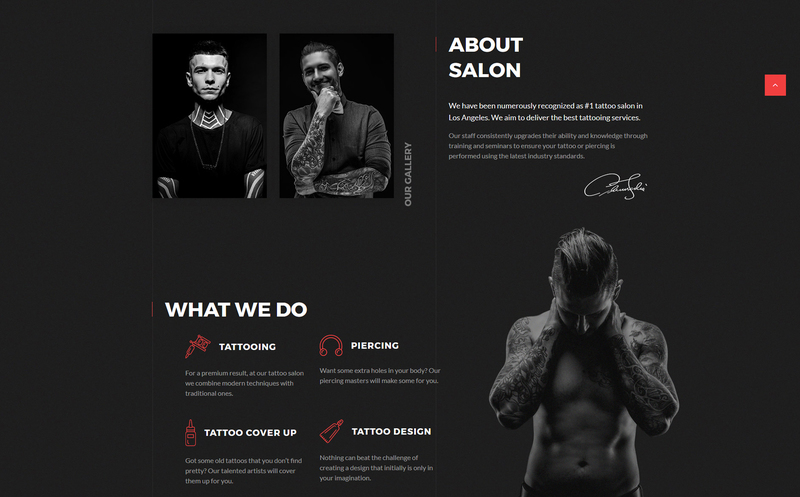 What is a one time usage license for a website template for Tattoo Salon Equipment Shop? When you buy the website template for Tattoo Salon Equipment Shop at usual price you automatically get the one time usage license. It enables you to use each individual product on a single website only, belonging to either you or your client. You have to purchase the same template again if you plan to use the same design in connection with another or other projects. When passing files to your client please delete the template files from your computer. What is the difference between unique and non-unique web template for Tattoo Artist purchase? Non-unique purchase:Non-exclusive purchase means that other people can buy the web template for Tattoo Artist you have chosen some time later. Unique purchase:Exclusive purchase guarantees that you are the last person to buy this template. After an exclusive purchase occurs the template is being permanently removed from the sales directory and will never be available to other customers again. Only you and people who bought the template before you will own it. What is the price for acquiring the extended license for website design for Fashion & Beauty Magazine? There is no set price for acquiring the extended license. The price is based on the website design for Fashion & Beauty Magazine's unique price for those templates you would like to use for the integration. The price for purchasing license for a single template is half of the template unique price. Can I customize the website design template for Cosmetics Manufacturer if that's required by application settings? Yes, you can customize the website design template for Cosmetics Manufacturer code, graphics, fonts to any extent needed. Will TemplateMonster help me to install my website design for Design Blog? Some of our products like osCommerce templates, Zen Cart templates, etc. require installation to operate. Installation services are not included in the package price. TemplateMonster though offers you a variety of sources to help you with installation of your website design for Design Blog including installation instructions, some articles with our Online Help Center. Our Knowledgebase contains customers questions and most frequent problems. Anyway, you can always refer to our partners from TemplateTuning.com to install your website design for Design Blog for you for a small fee. How can I modify web template for Online Fashion to suit my particular website? Please visit our Online Help Center to obtain detailed instructions on editing web template for Online Fashion. 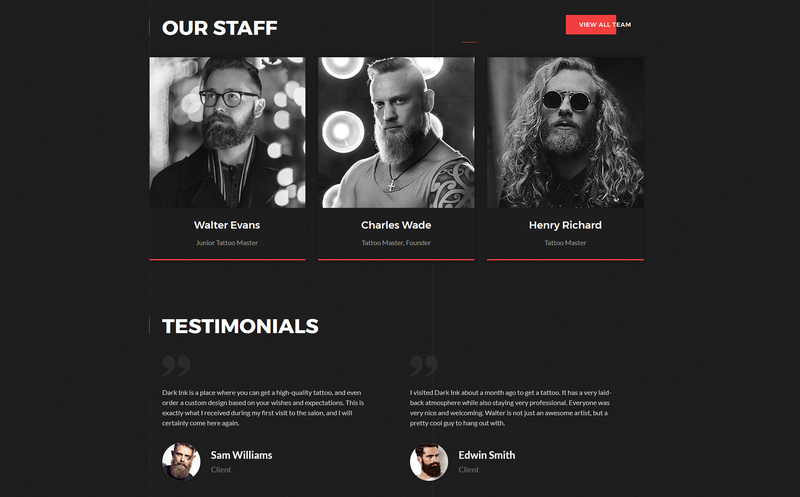 Will TemplateMonster help me to edit my website design template for Tattooer ? 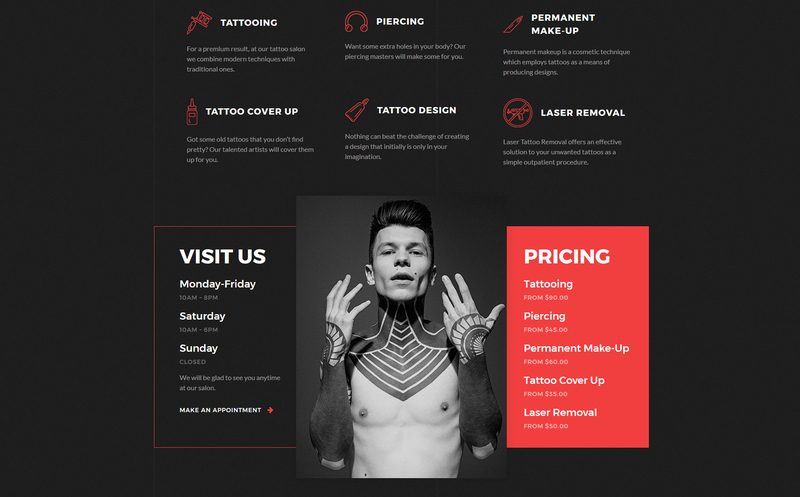 TemplateMonster offers you a variety of sources to help you with your website design template for Tattooer . Use our comprehensive Online Help Center to get the basic knowledge about your website design template for Tattooer . Our Knowledgebase contains customers questions and most frequent problems. Anyway, you can always use TemplateMonster 24/7 phone support, try our Ticket System or Live Support Chat to get qualified assistance from our support representatives. Can I get the extended license for some other pricing than the half of the initial website design for Designer Portfolio price? No. The price for purchasing license for a single website design for Designer Portfolio is the half of the template unique price. Can I put a line at the bottom ( or any other spot) of the customized Fashion Stylist website design "Website design by Company name"? No, you cannot place a line at the bottom ( or any other spot) of the customized Fashion Stylist website design saying "Website design by Company name". Nevertheless, you can place "Customized by Company name". I like this template for it&#039;s style and it&#039;s use of black and white. Great layout, could have more varied content to use if you&#039;re a beginner.